Facebook FAQ: Is Facebook right for my brand? Many brands struggle with whether to invest valuable time and effort into Facebook, and it is not a decision any marketer or business owner should make lightly. How will a Facebook page satisfy my business goals? Facebook can be instrumental in driving website traffic, increasing brand awareness and providing exceptional customer service among many other goals. But what are you trying to achieve, and how will you achieve it? If you’re goal is to drive more traffic to your website where users will sign up for a free demo of your product, Facebook is certainly a tool to help you reach your numbers… IF you enact the right strategies. Make sure Facebook offers a unique incentive to prospective leads (like a discount of 20% if they choose to buy your product after your demo) to entice them to sign up. Is my audience on Facebook? There are two key components to discerning whether your target audience is on Facebook. Check out the data. Pew Internet research details precise demographics of users for various social networks and outlines which networks are best for reaching which audiences. Put on your listening ears. There are many great social listening tools out there that can help you evaluate whether your brand is already being talked about on Facebook (or other networks) – even tools at no cost to you! Does your brand have a Facebook page? How did you decide if it was the right network for your business? What’s said about them in the public sphere, that is. 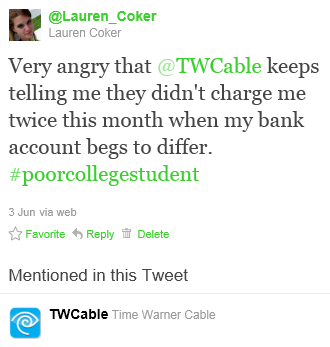 I recently had a bit of a run-in with Time Warner Cable. They charged me twice for the month of June and I was not pleased. As a poor college student, deducting an extra $101.48 (yes, it’s that much) from my account is in no way acceptable. To solve this problem, I chatted online with an “Analyst.” She told me that they had not received multiple charges no matter how many times I tried to convey to her that the money was removed from my account, therefore they obviously had received it. After the pseudo-pleasant conversation with the “Analyst” during which I did my best to keep my cool even though I was wrapped up in a frustrating situation, I took to Twitter. I received a reply less than 30 minutes later. By end of day on June 3, my bank account was credited with a $101.48 refund. Here’s the real kicker: my boyfriend’s roommate ran into the same situation last month. He called Time Warner Cable several times before being able to convince them that they had charged him twice. Finally, he was told he would receive a refund within 24 hours. It was two weeks before his account was credited. Why the discrepency? No consumers in the Columbus area will hear the many calls my friend made to TWC, but the tweet I sent on June 3 is visible not only to the Columbus community, but the whole world. This is now part of the crisis communication PR professionals are trained in. Brands don’t want bad blood circulating around the web and the only way to rectify the situation is to create a timely resolution to the problem. 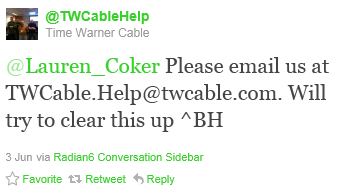 In my case, TWC did, and therefore they received a tweet from me thanking them for their speedy solution to my problem. And while word of mouth is still a huge part of a brand’s communication strategy, it may no longer be a brand’s main concern. As I began to expand my Twitterverse back in October 2010, I started coming across a variety of different PR, marketing, and social media blogs. While the “traditional” PR blogs offered good insights, I find myself taking more interest in posts and stories about how to effectively use social media as part of your marketing efforts. Although I have been studying traditional PR (among many other things), I’ve found that my interest lies more in the realm of social media marketing, and I’m one of the very lucky individuals that has secured a post-graduate career in my field of choice. One blog that has offered me great insight and advice over the past 6 months or so is PRtini.com, written by Columbus resident owner of Geben Communications (@gebencomm) Heather Whaling (@prtini). Having had a personal chance to meet Heather and hear her speak in a class at Ohio State made reading her blog a “no-brainer,” but what lent to her credibility even more was her prominence in her field. Heather’s blog is recognized nationally as one that all PR/marketing professionals should be reading. While much of her content focuses on social media in relation to PR, media pitching, blogger relations, etc., you can find occasional posts regarding social media in the world of marketing. Heather recently posted on her blog a link to a story she wrote for Mashable – “5 Ways Social Media Has Changed Marketing Campaigns.” What I liked most about Heather’s post is her format and her use of external sources. Typically, Heather’s posts contain a bulleted list with main points, which make for easy take-aways and mental notes. Heather also uses outside sources (typically other PR/marketing professionals) to back up her claims – and she includes their twitter handles. That leads me to my next source of social media marketing news – Mashable.com (@mashable). I often peruse the Mashable site looking for insightful posts or posts that will help me with current endeavors. I often find one or two extremely useful posts per day, but I typically stumble upon (no, not using StumbleUpon) quite a few posts that I probably should read, but they don’t immediately spark my interest. What I like about Mashable posts is that authors often provide real examples of what companies around the world are doing. For example, today I read the post entitled “4 Creative Ways to Reward Your Facebook Fans.” Mashable writer Leyl Master Black (@mktgalchemist) shared specific examples of ways companies have increased their fan base and rewarded those fans. Another feature of Mashable that has proven beneficial is searching for content by author. I often find that the author of a post I enjoyed reading and actually learned something about has authored posts in the past that are also relevant to my interests. Pingdom.com reported that there are 152 million “blogs on the Internet (as tracked by BlogPulse)” in January 2011. Finding the ones that fit your niche takes time and research, but in the realm of social media marketing, PRtini and Mashable.com are key providers of compelling content that any young PR/marketing professional will benefit from.